There are a few ingredients to chiropractic success that we can learn from our profession’s recent victory over United Healthcare and their prohibitive policy on headaches. 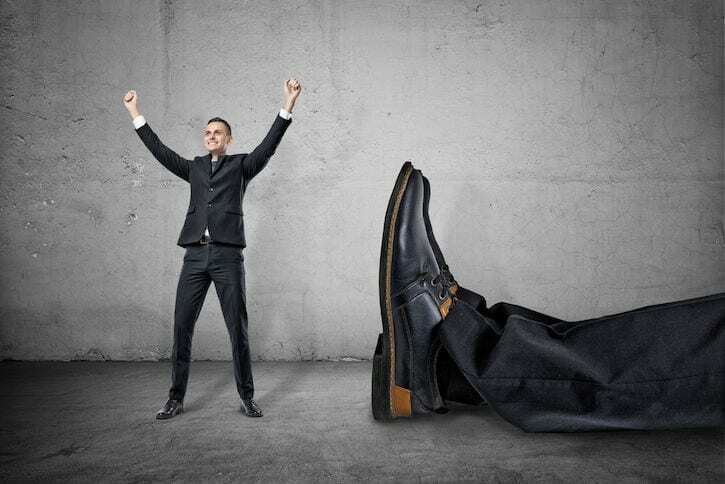 And these things may also serve as a quick reminder to us that chiropractors can and do win victories over giants as a profession — and that you can succeed in overcoming your personal “giants” in your practice as well! Too many chiropractors have a tendency to stay within our own chiro-bubble and bemoan all that happens to us as the underdogs. We focus on the challenges that are facing our practices, the changes we are forced to make in our business and we often (mistakenly) conclude that everyone is struggling or that our profession is somehow skewed towards eeking out a mediocre existence. We act as if chiropractic success is a rare bird that belongs on some sort of list destined for extinction. This inward focus also causes us to miss out on opportunities to model success shown by other businesses – big and small – or adopt similar strategies utilized by other health professionals (such as dentists, orthodontists, physical therapists, etc) that enable them to thrive in the very same economy that we are in. If this navel-gazing continues for long enough, our beliefs begin to harden (whether accurate or not), we become cynical and we may begin to fail to notice the chiropractic success stories that surround us. David Beat Goliath – And You Can Too! If you have ever read or heard of the Biblical account of David and Goliath, it’s likely you know the ending. Little guy with the sling and a stone defeats the enemy’s big champion. But there are some key details many forget. First, David had the confidence (propelled by the faith that God would help him succeed) to face the giant. Faith definitely helps, although you don’t have to take a religious stance in your business to have this apply to you because you can also look at David’s victory through the lens of HISTORY. David knew that God had brought his people (the Israelites) out of various trials and troubles before and correctly reasoned that it could be done again. Similarly, you should know that the “giants” you are facing in your business and that we face collectively as chiropractors have been conquered by the “little guys” long before you were around and certainly can be defeated again. Our profession has an admirable history of winning legal battles for the right to practice, against insurance payers who treat us unfairly and in turning the tide of public perception positively towards what we do. Most recently, we gained a victory against United Healthcare when pressure from the ACA and state chiropractic associations caused them to rescind and revise their policy on headaches and chiropractic proving again that little guys can win! Stop and let that victory sink in for a minute. A billion dollar company that serves millions of customers listening and altering their payment policy based on the grassroots political efforts of one profession comprised of some 50,000 providers. No other healthcare providers were affected by this policy but DC’s. UHC didn’t have to change it – but they did. #Littleguyswin! Certainly, progress can still be made within our profession and there’s much to do. But from a historical profession our profession has survived for over 120 years in spite of constant opposition and threats from many different “giants.” So, viewing our present challenges through this lens, you should feel confident to pick up your sling and stone and go to battle anticipating a victory as well! Chiropractors who dwell in their own bubble fail to look outside of chiropractic to see that businesses are thriving all over in the same economy and marketplace that they are in. In other words, if we aim our eyes only on our profession, we lose that perspective and begin a “us vs them” world where everyone is pitted against us. There’s room in the universe for what we offer and, look around, plenty of money for people to pay for it. Tony Robbins likes to say that “success leaves clues” and I wholeheartedly agree that chiropractic success will follow the same formula. What Robbins doesn’t say is that you can only take those clues from within your own business and your own profession. Similarly, if we focus only within our profession, we tend to talk to friends and colleagues who are at or even below our level of success to confirm our “suspicions” of what we want to hear or fear: struggle. After all, if your practice is not performing up to its potential, it can be a rather annoying reminder of that fact when you talk to the doc who just hit another record-breaking month in practice. While this is understandable from a psychological standpoint, it is definitely not helpful or productive to achieving chiropractic success. Instead of commiserating with those who are failing or flailing, we need to look at the businesses of chiropractors who are thriving to find examples of success to model. Better yet, we need to seek out chiropractors, coaches or mentors who can lead us there. Because there ARE docs who are thriving in each and every corner of our country and beyond! But because we lack community in our profession and we tend to dwell inside our own chiro-bubbles and practices, it’s likely you just aren’t talking to any or enough chiropractors who can show tangible examples of chiropractic success. Motivational speaker Jim Rohn was often fond of saying that you are the average of the five people you surround yourself most with. For many chiropractors, that average equals zero because they are hidden inside the four walls of practice. It’s not surprising, then, when the zero average leads to…stuck. On a personal level, there is one key to business success that goes above and beyond history, perspective and even potential. Restaurants and fast food chains love to call it their “secret sauce” but it’s not exclusive to them. In fact, you definitely have it as a chiropractor. Part of the “secret” is how you implement it and use it to wow your patients and even your adversaries. Back to David and Goliath, the little shepherd boys “secret sauce” was his unconventional method of attack. Goliath was a champion in a time in the world where “single combat” was the norm and where one side lined up against the other to face off. Goliath won these battles easily; after all he was bigger, stronger and more experienced than all of the contestants he faced. So it was only natural for him to conclude that the little adversary who approached him would be an easy defeat. What Goliath did not anticipate was that David would skip the sword and the hand-to-hand combat method and instead, attack him from afar with a sling and stone. Your chiroporactic business isn’t much different. Yes, as chiropractors, we are little. Yes, we can’t outspend the corporate medical giants around us or the advertising campaigns of Big Pharma. We may not even be able to compete one on one with other health professionals in our community. But the element of surprise? We’ve got the ability to deliver on that! For some of us, we have been in our profession for long enough that we forget two big things about chiropractic: first, it works! There is a ton of research and its growing rapidly in support of what we do. Secondly, we forget that to succeed in virtually every business, you need to exceed your customer’s expectations. And that is possible in part due to your “secret sauce” which makes you different than everyone else and in part due to a focused effort on your part to deliver excellent service in a way that other professions just can’t! I hope that this post has been both challenging and encouraging and if I may, I’d suggest a few action steps for you to put these ideas in motion in your office. Solidify your secret sauce – spend some time thinking, communicating with your staff and ultimately to your patients about what makes you different. Sure, we are all different as DC’s from MD’s. That’s one level of distinction. But go as far beyond that as you can to differentiate yourself not only from MD’s, PT’s but even DC’s. If you can literally put yourself in a corner and state, “unlike most ___, we specialize in A and B to help you get X, Y, and Z” then you are on your way to standing out from the crowd and eliminating competition! Consider Your Community: the chronic complainers will always have something to whine about in our profession. The difference between them and someone who actually makes a difference is in the “doing.” While it can be helpful to have someone point out the flaws in our profession or our practice if the aim is improvement and chiropractic success — move beyond listening to the moaners and get yourself in the company of some movers who actually make strides to improve and not just complain. A truly successful chiropractor (or any other achiever) will humbly admit they didn’t get their on their own but were supported, encouraged, coached, mentored, inspired and perhaps even poked or prodded by a community of others who helped them along the road to chiropractic success. Too many chiropractors struggle by staying isolated with no outside perspective or help. Even if you’re happy in your bubble, to grow, that bubble has to burst so you can move beyond where you are. On the other hand, if you’re feeling like the practice bubble you are in here, won’t get you there (to where you want to go) and its time to strike out on your own, get a new job or pursue practice ownership, I’d encourage you to take those steps sooner, before cynicism sinks in. I’d also recommend you view our FREE Buy, Build or Break Up Webinar where we will be discussing these issues in detail to discover the best strategies for purchasing a practice, starting one from scratch or getting a new associate job. Lastly, if you need assistance formulating your plan to “check” out by selling or transitioning out of practice or even just taking things at a different pace, you should definitely check out our FREE Sell, Switch or Slow Down Webinar where I will be discussing how to maximize the value of your chiropractic practice sale or transition and minimize costly mistakes. Over 6000 chiropractors have taken this webinar to help solidify or start their transition plans, you should too!